This is awesome. Is there support for adding in or accounting for covariates representing observed or hidden confounding factors? If not, do you plan to add this extension in the future. In my experience, this is a major drawback of many of the multi-sample differential analysis tools in that they do not integrate seamlessly with some of the confounding factor estimation and correction tools. It would be a fantastic addition to this tool. I’m looking forward to testing this out. We currently support arbitrary designs for fixed-effects. This means you can condition on batch effects and still measure the ‘fold-change’ between conditions. This sounds great!! I have been using Kallisto and I am really impressed by its speed and its results. I am looking forward to give sleuth a try. 1) How does sleuth behave if the data set has lots of dropout events? In the analysis of single-cell RNA-seq data one is confronted with lots of genes that have a moderate or even high expression level in some cells, but were not detected in other cells. I experienced that these dropouts can lead to a dramatic increase of the false discovery rate for some of the “classic” tools, such as edgeR. It would be super interesting to know how sleuth can deal with those challenges that are specific to single-cell data. 2) Were you guys thinking about submitting this package to Bioconductor? I know it is work, but it is just super convenient for users. It might also push its publicity as you can announce the package through the Bioc mailing list addressing probably hundreds of potential users. Katja, don’t you have so many samples in each condition for single-cell data that you can just use e.g. non-parametric tests? That is actually a good idea. I will definitely consider this. 1.) I wouldn’t expect it to do much better than existing methods for dropouts as we do not explicitly model them. However, in our simulations and some datasets we’ve tested we seem to have higher sensitivity due to the modeling of the technical variance. That being said, we’ve actually been thinking a fair bit about scRNA-Seq in this context and will be extending the model as soon as we’ve stabilized sleuth for bulk RNA-Seq. 2.) We’ve been thinking about where to submit it. I’ll take a look at BioC requirements over this week. I definitely agree the BioC community is a great resource. 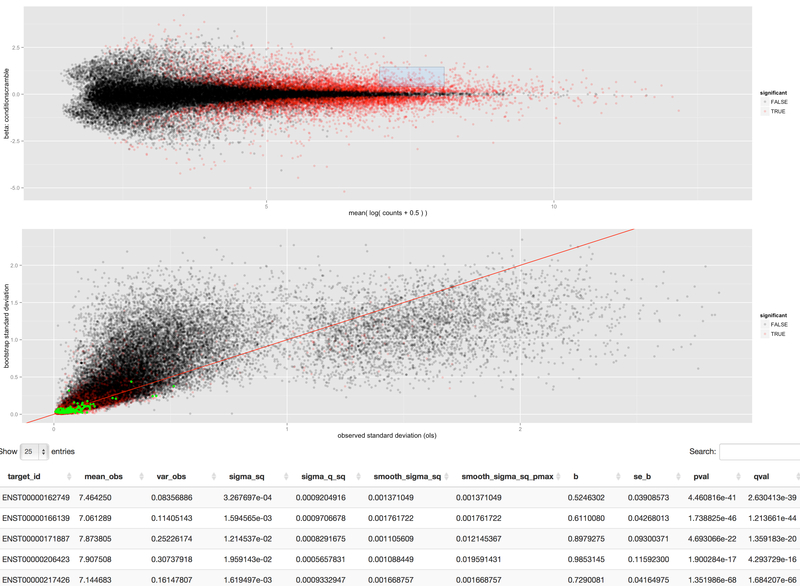 How would you model technical variance for single cell? There aren’t technical reps (each cell can only be sequenced once) and for low input RNA seq (which is probably the closest) Poisson models often break because of the PCR cycles and dropouts. Thank you, Harold! Good luck with it!! There are actual methods for single cell RNA-seq differential expression analysis, such as SCDE. Of course it would have been very nice to not have to align SC data, since there’s usually so much of it. You have to consider the UMI barcoding too since SC is so much more sensitive to PCR replication errors. Very glad you support arbitrary designs, so much flexibility now. I was wondering how you were going to use the bootstraps effectively. I’m off to show my data to a collection of members of the family Ursidae. Hi. Can Sleuth distinguish differential transcripts that do not change total gene output vs those that do? The former would be possibly related to isoform switches and might not be picked up in gene count based methods as a DE gene, whereas the latter would perhaps be seen as DE genes by those same methods. Thanks! First, it is important to note that sleuth identifies differential transcription of individual isoforms. Yet it is possible to use it for a gene level analysis by virtue of “lifting” the results and we will be releasing an update next week with some new features that facilitate that. What the “lifting” means is that we examine for each gene the most significantly differential isoform as a measure of how differential the whole gene is. However this is by no means the only way to think about what it means for a gene to be differential and you are absolutely right that it is separately interesting to examine specific instances where isoform switching is occurring in the absence of overall gene level change. It is easy to facilitate searching for those in our framework and we’ll be adding that as a feature as well. When you write “we examine for each gene the most significantly differential isoform as a measure of how differential the whole gene is” does that mean you do not consider the actual abundance of the gene? How will that work for an isoform switch where one isoform is significant up and one is significant down (but the gene stays around the same) – what is the conclusion at gene level then? Whichever get the lowest p-value? That is wonderful! We actually have technical reps for our RNA-seq data and we are trying to look at the changes at transcript levels. I have been looking into how to make better use of the technical reps and it seems sleuth provides the solution! I have not been able to find time to try out Kallisto yet, but i am wondering if sleuth supports quantification results from other software, such as sailfish and salmon? sleuth requires measurements of the uncertainty in quantification, currently supplied via the bootstraps of kallisto. These are crucial for the improved performance over other tools. I am not currently aware of any other quantification software that outputs this required information. Thank you very much for your reply, Lior. If I understand correctly, the bootstraps of Kallisto is used to estimate the technical variances. Given i have technical reps, is it possible to derive the technical variances directly from the technical reps (instead of using bootstraps)and feed them to Sleuth? IsoDE — http://www.biomedcentral.com/1471-2164/15/S8/S2/ — uses bootstrap information from IsoEM to perform differential expression testing, and these bootstrap estimates can be generated using their “isoboot” command as described in the IsoDE readme (http://dna.engr.uconn.edu/software/IsoDE/README.TXT). Salmon can also provide uncertainty measurements via posterior Gibbs sampling. Presumably, if the data were converted into the appropriate formats, the Kallisto estimates could be utilized by IsoDE and vice versa. Thanks Rob. You’re absolutely right that other tools provide estimates of uncertainty in quantification. To my knowledge the first to do so were Cufflinks (with v 2.0) and around the same time BitSeq. In terms of utilizing the bootstraps in differential analysis, if you read the IsoDE paper you’ll see that the approach taken is not model based in the way sleuth is, so it really has very little to do with our approach, other than that “bootstraps” appear in both. Hi Lior, Sure — the line of reasoning was more in the IsoEM => Sleuth direction than the other way around. Specifically, IsoDE uses bootstraps from IsoEM to provide measurements of uncertainty. How these bootstraps are used internally in the DE calling is, I presume, substantially different. However, the bootstraps themselves should have the same interpretation. Cufflinks (as you suggest) was among the first methods to provide uncertainty estimates, but does so via an asymptotic normal approximation about the MLE. This provides potentially useful information, but I’d assume that the non-parametric approaches (bootstrap a la Kallisto or IsoEM, or collapsed Gibbs a la BitSeqMCMC or Salmon) would be more accurate. – From the paper it doesn’t appear support anything beyond a standard two-sample test. – The setting of the free parameters seems a bit worrisome. Due to the fact that these are user-selected parameters, I’m not sure how one can even attempt to control the FDR. – It’s unclear to me how their method generalizes beyond two samples. Clearly it does since they have results, but I have no idea how it’s working. Maybe someone else can chime in here. – In addition to this, resampling tests often do quite poorly when the sample size is small due to the fact that you have so few samples and that there are only so many (biologically) relevant permutations. By the time you’ve FDR corrected your test, the smallest FDR is quite high. Bootstrapping doesn’t just make this go away. Anyway, if you’d like, I’ll look into benchmarking Salmon + IsoDE for the upcoming preprint. Thanks for the detailed reply! The beginning of the semester here has been even busier than usual or I would have responded earlier. Actually, my interest was more in the other direction. What I mean is that I can see a world of difference between the approach taken in Sleuth vs. the one taken in IsoDE (from what I can gather from Lior’s blog post and the code). The question was whether it would be possible to use the samples generated by other *quantification* methods in the analysis pipeline of Sleuth. For example, if one ran IsoEM’s “bootstrap” script to generate bootstrap samples, one could conceivably (after some data format massaging and some HDF5 hair-pulling) feed these estimates into Sleuth. The question would then be, can the variance estimates produced (as samples) by other quantification methods be used in Sleuth to yield better differential analysis results for those quantification tools (then e.g. DE methods that don’t consider such samples or methods that consider such samples in a less expressive way). For example, would doing an analysis with Sleuth using IsoEM’s estimates and bootstraps yield more accurate differential analysis results than pairing IsoEM and bootstraps with IsoDE, or IsoEM with DESeq etc.? Given the benefits of your model-based approach, this seems like it may be likely, in which case Sleuth would provide an additional *boost* to methods that already provide such sample-based estimates of uncertainty. I’m not really sure whether IsoEM would work well with the differential analysis methods of sleuth, but if the IsoEM folks want to explore that they are certainly welcome to do so. I want to know that does Sleuth work for non-replicate RNA-seq samples and does it take orphan reads ( reads present in paired-end data but don’t have pairs). could you speculate on the benefits or limitations on using the Kallisto/sleuth pipeline to analyse RNA-seq data at the community level (metatranscriptome) and perform a differential gene expression analysis ? The main challenges I see are to deal with the presence of different types of RNA, the high redundancy of sequences, the variable coverage and presence of closely related organisms which increases the proportion of chimeric contigs during the assembly… Some of these are tackled by tools like SortMeRNA which basically sits in the middle of a classic RNA-seq pipeline… so I wondered if your pipeline could help improve current analyses both in terms of accuracy and time ? I’m very interested in trying this out. However, I need to use spike-in standards for normalization (without going into to much depth — I study changes between a diploid/polyploid which throws out the assumption that the transcriptomes are of equivalent size). In edgeR and DEseq I can simply subset out my spike counts and use that to calc size factors. Is slueth capable of doing something analogous to this? Currently, no. We hope to allow this in the next release which should be coming within a week or so. Some other goodies will also be packaged here. Thank you for the quick reply. Great news on the upcoming release. I will certainly stay tuned! How would you go about also obtaining gene expressions? Just adding up the TPM values of all transcripts belonging to a gene? Is it possible to also do a DE analysis on gene level? Just started perusing the preprint for this software package. I had a question regarding # of biological replicates. In your simulation you used three biological replicates; how much worse do things get if you only used two? We are set up to replicate our analyses with variable numbers of replicates to explore this question and plan to do so in the near future. I can say anecdotally that there is a huge loss of power with just two replicates for each of two conditions rather than three. See for example the q-values for the sleuth analysis of the Shi-Yan paper on The Lair (the sleuth analysis is here). How is it possible to use a self-created gff3 file for sleuth rather than to use ensembl via [biomarRt](https://github.com/cbcrg/kallisto-nf/blob/master/bin/sleuth.R#L19) for a de-novo project? Hi, so I have used Kallisto and sleuth for my time course differential gene expression analysis, I used 3 biological replicates for each gene, however for some gene, only one biological replicate is showing expression on the heatmap, whereas the other two shows no expression. for some other genes, using the same biological replicates, there is consistency in all of the biological replicates. what could be the problem in seeing on an expression of one biological replicate and no expression in the other two? What do the error bars in the transcript abundance boxplots represent? Thanks! These are estimated using the bootstrap in kallisto. They represent the uncertainty in quantifications due to random sampling of reads and estimation of abundances using the EM algorithm. You can read more about this in the kallisto paper.